As always we are making upgrades to the FundMonkey campaign management platform to provide more services and to make it easier to use. Here are a few of the upgrades implemented for the 2017 season. We added new language to the animation overlay when sending emails and donation codes from FundMonkey. The new overlay reminds users that sending hundreds of emails can take a few minutes and navigating away from the sending screen will stop the process. So, the new language reminds users to sit tight and wait for the process to finish. We changed the language for credit cards that are declined. Credit card donations require the donor to input accurate information. If the card information is inaccurate, the credit card gateway will reject the transaction. FundMonkey would report back with a message that said “Credit Card Declined” when in fact it may have not been processed. Last year we had 6 or 7 donors call us with the complaint that we were declining their cards. And when we entered the donation manually, the card went through. The new message says “Oops, something went wrong” and provides options for donors to retry, by turning off autofill in their browser, or switching to a different browser. We add proceeds from online registration fees to the Fundraising page thermometer. Before they had to be added manually. We made a slight change to the online registration capabilities so when participants select an event. If the second event is enabled, the second event, won’t auto-populate the adult or student section. It worked fine, it was just confusing to users. We’re pretty excited about our newest feature. 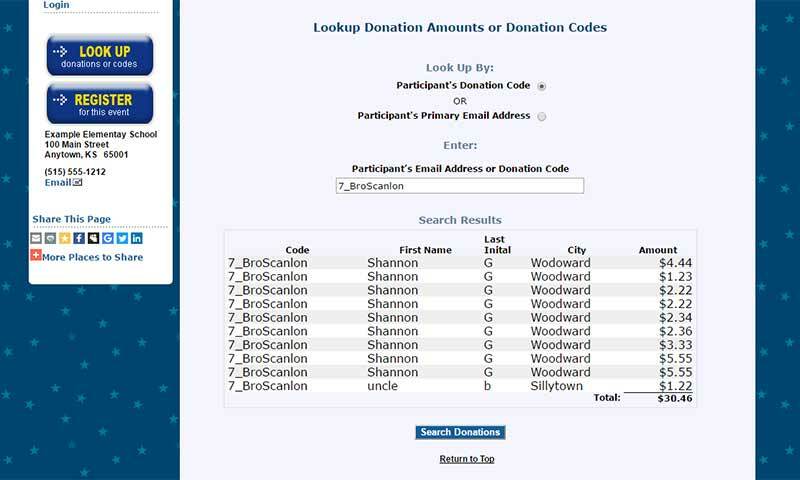 Many fundraising parents think that their unique code should allow them to log into the site, but the code is only for managing online donations. Even though we send donation confirmation emails to both the donor and the participant, sometimes that isn’t enough. Or sometimes, those emails may end up in a spam folder or the parent has a wrong email address on file. 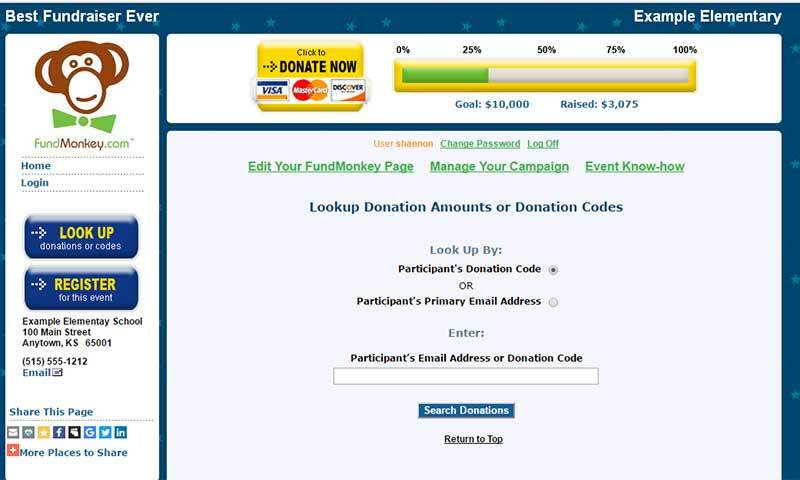 Now Your fundraising administrator can Select “Lookup Online Donations” in the “Edit Your FundMonkey Page” menu and select “Yes or No” on “Enable Donation Code Lookup”. Selecting “Yes” will create a new blue button “Look Up donations or codes” Using your email address, you can lookup your donation codes and amounts for all participants that share your email address. Entering the donation code will also show donations for that participant. Typing in your donation code or email address will result in the following information being displayed. This tool should answer a lot of questions from parents and make the campaign portion of your fundraiser MUCH smoother.